...into the Bay of Chissiapiacke. . , . . So wrote John Smith over 400 years ago, describing the arrival of the Susan Constant, Godspeed, and Discovery in Virginia’s waters. We can forgive him for spelling “Chesapeake” in this odd way. In 1606 almost no Englishmen had ever heard of such a name. It was an Algonquin Indian word meaning “land along the big river.” English settlers and Indian natives would soon make a grim history in that land. Revenant is a novel about survival. 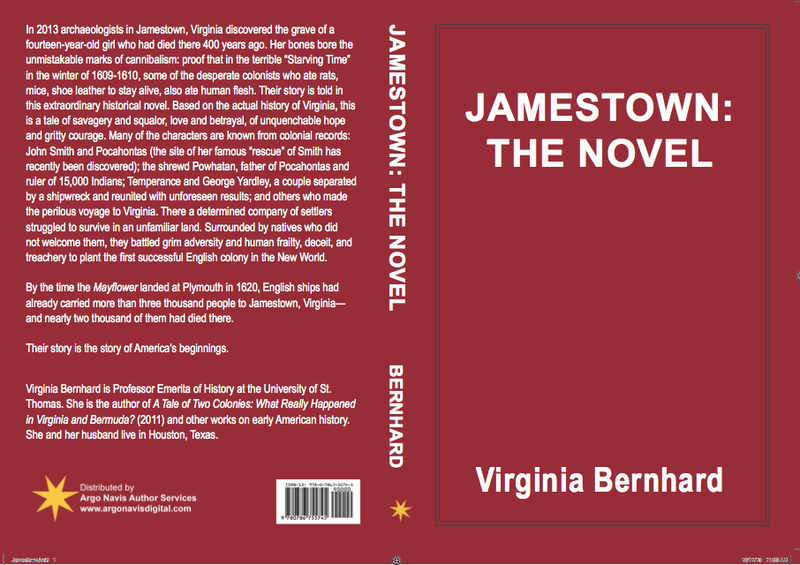 Jamestown: The Novel is about the survival of a colony. Sea Travel, 1607: Getting There was not Half the Fun. The Susan Constant replica at Jamestown, Virginia. Worth a trip to see, along with everything else there. 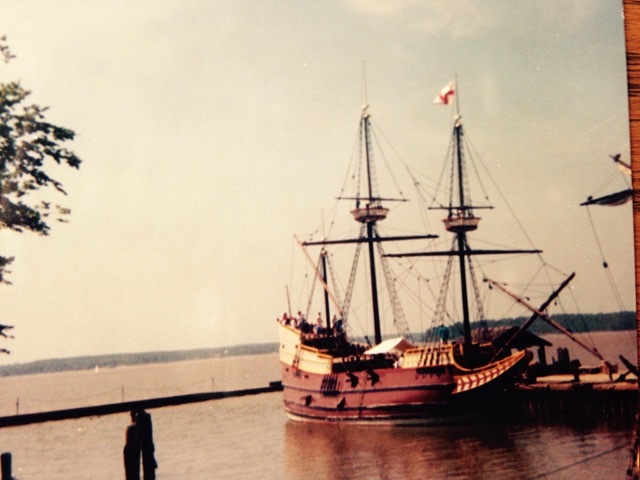 The Susan Constant was the flagship of the historic voyage to Virginia in 1607. At 120 tons, she was 111 feet long and 24 feet, 8 inches at her beam. She carried 71 people across the Atlantic in a voyage that lasted from December 19, 1606, to April 26, 1607. Her smaller sister ships, the Godspeed and the Discovery, sailed with her. Nobody had a good time. With this tantalizing conclusion, Smith leaves us to wonder what happened next. Where was Pocahontas? Smith’s earlier use of the phrase “Pocahontas and her women” could mean that Pocahontas was among the dancers. Were the other young women some of Powhatan’s many wives? Were Smith’s English companions also given this special treatment? And the most important question of all: in the absence of Powhatan, did Pocahontas and the other young women stage this ceremony for their own amusement? If these young women designed their dance to flaunt their femininity before the Englishmen and to mock masculine prowess in hunting and fighting--the principal activities of Indian males--then this ceremony suggests not only Indian women’s awareness of the importance of gender roles, but a shrewd and subtle humor in the use of them. If Pocahontas had an adolescent crush on John Smith, she may have contrived to entertain him thus, and perhaps to flaunt her sexuality before him, without the constraints of her father’s presence. Whatever the nature of their relationship, it was very close, and on one occasion Pocahontas risked her life to warn Smith and his men of a planned surprise attack on them by her father. --an excerpt from Virginia Bernhard, “Pocahontas Was Not the Only One: Indian Women and Their English Liaisons in Seventeenth-Century Virginia,” in Searching for Their Places: Women in the South Across Four Centuries, Thomas W. Appleton, Jr., and Angela Boswell, eds. (Columbia and London: University of Missouri Press, 2003). 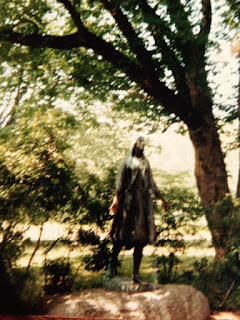 This statue of Pocahontas is at Jamestown, and a replica of it is in England at St. George’s, where she died. “I left him in England,” Rolfe said sadly. “At the time, I thought Virginia would be no place for a two-year-old with no mother, so I sent Matachanna and Tomocomo to take him to my cousin in London.” He sighed. “I also thought that if I brought him back here, Powhatan might want him raised as an Indian, and there might be trouble. So I left him, but I already wish I had kept him with me,” he said ruefully. Pocahontas’s only child, Thomas Rolfe, did come back to Virginia. He married, and had one child, a daughter, who, in her turn, married, and had one child, a son. . . . So there is a line of descendants from Pocahontas, and many more who claim to be related to her. Without Pocahontas and her charming ways, Indian-English relations in early Virginia might have been disastrous. 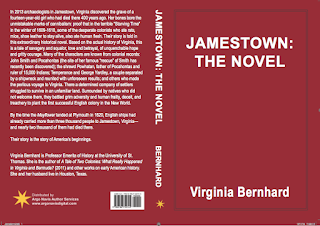 Her marriage to the Virginia colonist John Rolfe (along with her conversion to Christianity) was a cultural triumph. She was not a princess, but when she visited London, she fascinated the English, who treated her like a celebrity.